IMPORTANT! All federal tax return preparers must have a current year PTIN. Click Here to Renew or Sign up Now! 1) Are we an IRS-approved provider for tax continuing education courses? 2) Do I need to finish my training in one session? No, you can do it at your own pace. 3) Is the Certificate of Completion available once I finish my course? Yes, once you pass your exam for that course, the "Certificate of Completion" will be automatically sent to your e-mail. At that time, the certificate will be printable. 4) How does the IRS know that I have completed the course? After successful completion of each course, 1040 Education, LLC will submit your completed hours to the IRS by the next business day at no extra cost to you. This expedited next-day reporting service ensures your continuing-education status is current so that you can quickly renew your PTIN as soon as you are ready to do so. 5) Does completing my hours renew my license? No, you will still need to renew your license with the IRS through their system and fulfill any other pending requirements if applicable. Completion of the required courses merely fulfills the continuing-education portion of your license renewal. 6) How do I know my CE hours have been reported to the IRS? The IRS has communicated that they will update each PTIN holder's account with completed CE hours in the future. Our reporting to Kinsail, an independent administrative arm to the IRS, began August 15th, 2012. We will continue to update completed hours on a daily basis to Kinsail. 7) Do you accept checks or money orders for payment? Click here to learn more details about this method. 8) Is my online payment secure? Yes, your payments are processed through PAYPAL's secure encryption website. Your online credit card transaction is guaranteed to be secure. 9) How can I contact your company? Please go to our "Contact Us" section. 10) Is there a refund policy? If you are unhappy with our products for any reason we will refund you for all courses purchased within 30 days. However, we cannot provide refunds once you have received the course certificate and credit with the IRS. 11) How long do I have to complete my course? You will have 4 months to complete all courses after you pay for it. 12) I need to renew my PTIN or apply for a new PTIN. How can I do this? Click here to learn more details about this question. 13) Where can I find out exactly how many continuing education hours I need? 14) Do I have to reside in the United States to receive credit for the courses? No, you do not have to reside in the United States. You can reside anywhere and still receive credit. 15) How does our program work, i.e., how does the student take the course? courses. After carefully reading the course, he should take the exam. 70% is passing. Any exams with a score of less than 70% may be retaken. Upon successful passing of the exam, a certificate will be emailed to the student. For more step-by-step instructions, view our demo: Click here to learn more details about this question. 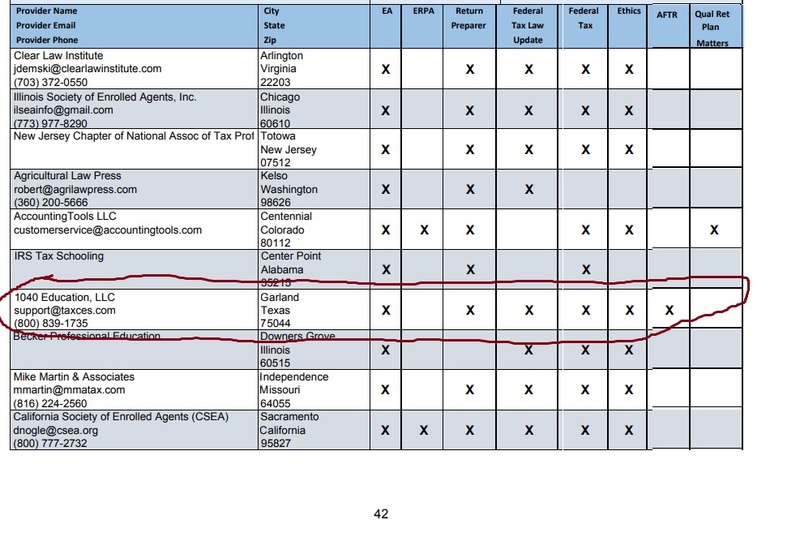 16) Where do I search to see if I am in the Tax Return Preparers IRS directory? Click here to go to the IRS Tax Preparer List for CPA,EA & Tax Preparers. 17) How do I obtain an AFSP "Record of Completion"? Click here for the General Requirements to obtain an AFSP "Record of Completion". 18) How do I view my continuing education credits? Great reading materials! I learned a lot that I did not know previously. I'm so glad I chose your program!!!!! The class was very convenient because I work crazy hours ... the pace was great. I learned some laws that I wasn't aware of to help my clients. I highly recommend this course to others. Thank you!! This is a good price for 15 hours worth of course materials. It was informative and affordable...worth every penny. The courses are easy to understand, especially considering the complexity of the U.S. tax codes. The pricing is very reasonable as well. I took the exam yesterday and passed. I have never taken a computer exam in my life, so your course prepared me for actual exam conditions. The superb content and the layout of the prep course was excellent. Bravo! I took courses for both the continuing education requirement and for test prep. All of the courses were very easy to understand and well written. The RTRP exam prep course helped me pass the test on the FIRST try! I can?t thank you enough for providing such reasonably-priced, quality courses. I just took the RTRP exam today and passed! I have not taken a test in over 20 years, so I was terrified at the thought of taking an exam. Your simulator course did a very accurate job at simulating actual test conditions. Thank you so much for providing such good materials at a reasonable price.